South end of my North facing SVO. 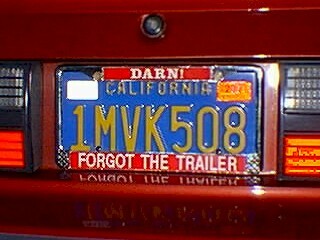 License plate frame reads "Darn! Forgot the Trailer" 1st place. After several weeks of enjoying summer in the high desert (100+ days and 25mph winds) it wasn't much of a struggle to get the car prepped for a show down near the beach. Leave the house about 6:00 am for a 90 minute drive down to sea level, and let the turbo compress some of that cool, dense air! 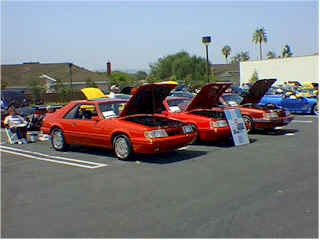 The South Bay Mustang Owners club is comprised of a cross-section of Mustang history. Being located near the beach, the SBMO shows always have a strong showing of truly stunning Mustang Convertibles. Around 100 total cars were present, mostly 64~66 and 95-up. SBMO has been putting on events for a number of years, and their experience showed with a well organized event. New SVO Owners Mike and Evelyn Koch scored a Second Place Trophy in their first show appearance. The show prep and detail work was very nice. 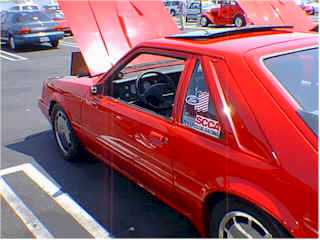 Their 1986 2R was formerly owned by long-time SVO enthusiast Ray Edwards, and obviously has found a good home. 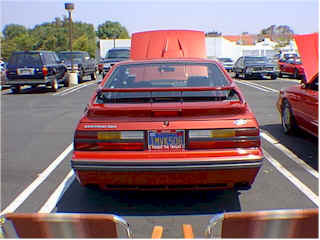 The car features polished wheels, a sunroof, Mac exhaust, and a Motorsport head and valve cover. Jimmy Shum got Third Place hardware. Rumor has it that Jimmy has a garage full of new suspension goodies just waiting for an excuse to get bolted on. Cya at the next one!